The R-1 Religious Worker Visa is available to Religious workers coming into the U.S. to work for a religious organization in a position of either a member of the clergy (religious vocations) or Lay Religious Worker (such as Administrators/teachers, etc). The R-1 is generally issued for 30 months and can be extended for the same period for up to five years total. Once an R-1 Religious worker in a religious vocation (minister, rabbi, etc) has been working for the U.S. religious organization for at least two years in a paid position, the religious worker (and his or her family) is eligible for apply for U.S. Residency (a Green Card). Accompanying spouses and minor children under age 21 of R- I visa holders automatically receive R-2 visas, which allow them to stay in the U.S., but not to work. On November 21, 2008, USCIS made substantial changes to the R-1 religious worker program which mandates USCIS church site inspections and tougher visa restrictions. At an inspection, USCIS may tour the facilities, interview organization officials and review organization records relating to the organization’s compliance with immigration laws and regulations. What is a “Religious Vocation”? A religious vocation is defined as “a formal lifetime commitment, through vows, investitures, ceremonies, or similar indicia, to a religious way of life.” Examples include nuns, monks, religious brothers and sisters. The new law adds a new definition of “minister”. Under the rule, a minister is “an individual authorized by a religious denomination, and fully trained according to the denomination’s standards, to conduct religious worship and to perform other duties as usually performed by authorized members of the clergy of that denomination.” Lay preachers, without ordination are not included in this definition. 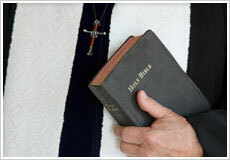 For more information on Religious Worker Visas, call or email our office to schedule an Attorney Consultation so that we can fully review your circumstances and give you the best, most honest advice concerning what steps you can take to obtain your Visa and if qualified, eventual U.S. Residency. To help you succeed in obtaining your Work Visa and Green Card, our Law Firm will carefully review your eligibility, provide valuable advice regarding your qualifications, prepare a professional case, properly support your case with all the required documentation, represent you through the proceedings and support you through the entire immigration process. We look forward to meeting you and helping you to achieve your immigration dreams!